Quorn Cricket Club is a friendly local club who play at the attractive ground on Cradock Drive. Our recently reappointed pavilion offers a pleasant base for teams during games and an ideal place to enjoy a drink after the game. We do not pay any players. 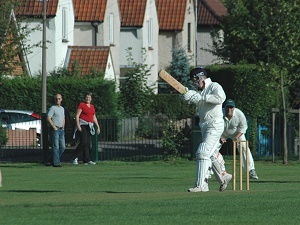 The first XI play a competitive level of cricket where many of the opposition sides will have an overseas professional. We prefer to find our own level with the people from Quorn and the surrounding villages who really want to play with us. Our 1st XI play in division 3 of the Leicestershire and Rutland Cricket League while the 2nd XI play in division 6 West. We really are very keen for some new players, as many of our players are no longer in the first flush of youth. This need is heightened this year, with the new league regulations requiring four frontline bowlers each match. The senior players practice on a Wednesday evening during the Winter at the National Performance Centre at Loughborough University and the juniors practice on Friday evenings in the summer at the ground.